Labor day has come and gone, and for most people that means summer is coming to an end. This transitional period between the end of sweet summer and the start of a new school year is what I’ve termed “Back to School Blues”. Although the term implies that these blues are reserved for students, the blues can actually be felt by all. You can experience back to school blues as an employee returning to work or a parent sending your child(ren) off to face another year of school. You can also experience regular blues when you’re dealing with general life transitions. If you’re experiencing 1 or more of these symptoms, and your symptoms are a result of an upcoming period of transition, you may be suffering from Back to School Blues. Fortunately, these blues are temporary and the cure lies within your personal autonomy. Slow down and breathe. Literally. Breathing helps to reduce anxiety by sending signals to your brain that allows your body to relax. Although the science behind how breathing aides in reducing anxiety is more complicated than that, deep breathing is a great and effective way to help you calm down if you’re in the middle hyperventilating or having a panic attack (or freaking in another way). This takes courage. Confront those thoughts that are causing you to worry. Think about the root cause of your worry. Ask yourself what’s truly causing you to freak out? What are you afraid of? Confront the troubling thoughts that are creating your blues. After all, the only reason the blues are relentless is because you keep avoiding them. This happens by letting go. Let go of your need to be in control. Accept that you won’t always be in control, and know that it’s okay to not always be in control. What’s going to happen will happen, no matter how much you try to control and/or manipulate the outcome. Accept that part of life is being able to adapt to changes in your circumstances. Contrary to popular belief, size does matter (when it comes to blues). If a task is too big for you, make it smaller! Reduce the size of whatever is making you feel overwhelmed by breaking it down into the smallest steps possible. A newborn lion cub is less intimidating than it’s full grown dad, right? Why? Because a newborn lion cub is tiny. It’s less threatening. Same can be said about the tasks you’re procrastinating on. The smaller the task, the less intimidating it is. The less intimidating it is, the easier it is to manage and the less likely you are to procrastinate. Although this step is last, you should probably do this first. The most important part of curing yourself of these blues is first believing that you actually are capable of administering the cure. You have to believe that are capable enough to deal with and get through this period of transition. Think about all of the times you’ve successfully got through what you once thought you couldn’t. You’ve got through difficulty before (no matter how hard it was), and you WILL do it again if you believe you can. Believe in yourself and you’ve already won half the battle. 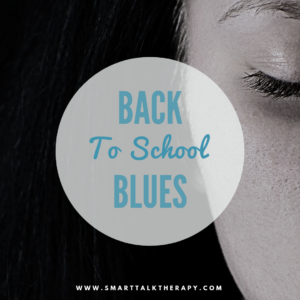 Whatever Back to School Blues look like for you, the main thing that you need to keep in mind is that there are things that you can do to cope with them. We usually see an increase in these symptoms at this point in the year and are here to help you through it. We continue to accept new clients from New York, Florida, Hawaii, Illinois, California, and outside of the USA (Canada, Australia, New Zealand, England, Ireland, Scotland, Wales, Italy, United Kingdom, Germany, France, Spain, Mexico).